Cinema Blend has the story here that a Shazam! film about DC's Captain Marvel has a very slim hope of making it to a theater any time soon. That is due to the Man of Steel sequel you've been hearing so much about. The one with Henry Cavill as Superman, Ben Affleck as Batman and Gal Gadot, from the Fast & Furious film franchise (who love alliteration, give me a hey now! ), just cast with Lynda Carter's blessing as Wonder Woman. So, it all comes back to Superman's fault. 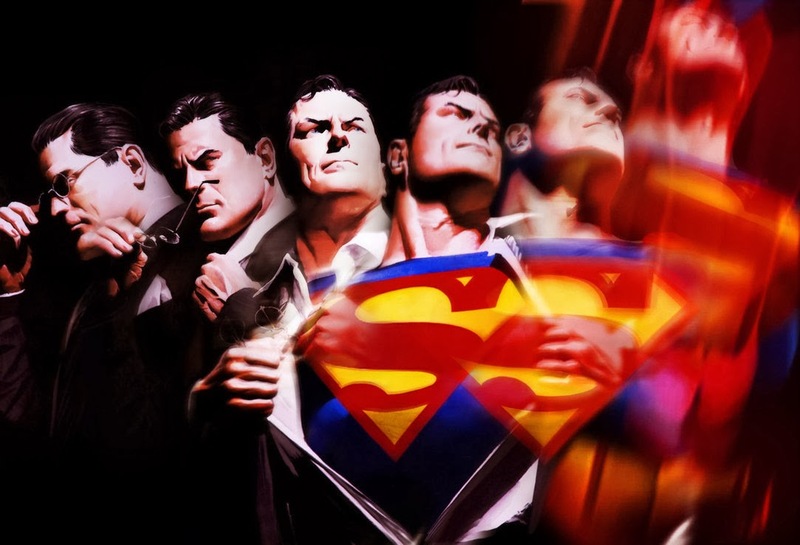 The Man of Steel and the World's Mightiest Mortal have a long history. A history of being adversaries. Here's a quick recap. Superman creators Jerry Siegel and Joe Shuster launched a super-hero boom. The most obvious, is that DC Comics - where Superman makes his home - wanted another character like Superman. Bob Kane created Batman, with input from baseball player and writer Bill Finger, and Jerry Robinson. 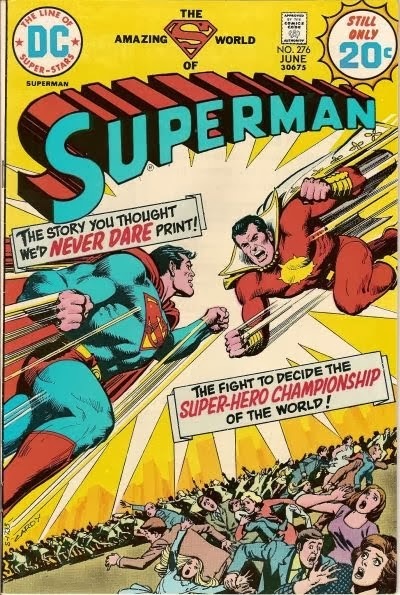 Like a bolt of lightning, other publishers tried to copy Superman's success. C. C. Beck and Bill Parker created Captain Marvel for Fawcett Comics. 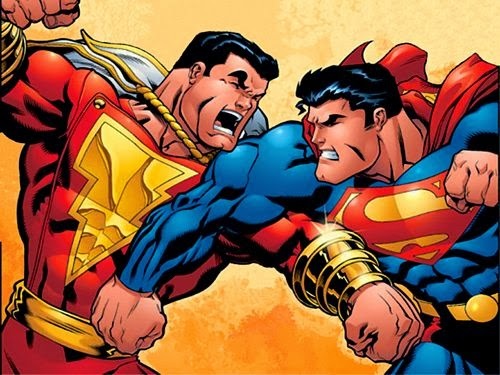 DC filed a lawsuit, claiming that Captain (Shazam!) 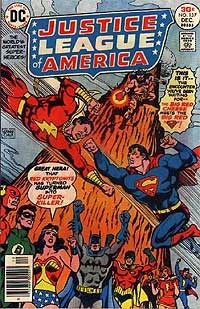 Marvel was an infringement on Superman. 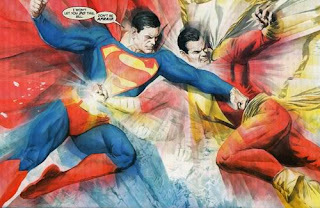 DC claimed that Fawcett had copied Superman as Captain Marvel. The Captain was shut down. 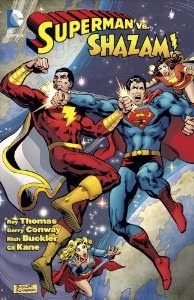 DC later acquired Captain (Shazam!) Marvel from Fawcett; but, after Marvel comics had developed their own Captain Marvel. DC had shut Captain Marvel down and now could not publish the character as Captain Marvel due to possible infringement on Marvel Comics. That's ironic. DC now used the character under the banner of the Wizard that gave Captain Marvel his powers, and whose name alter ego Billy Batson shouted to transform, "Shazam!" It might be hard to imagine just how similar Superman and Captain Marvel were at one time...now. Captain Marvel is really an orphan given powers far beyond mortal men by a wizard. He has the wisdom of Solomon; the strength of Hercules; the stamina of Atlas; the power of Zeus; the courage of Achilles; and, the speed of Mercury. Superman is an orphan with powers and abilities far beyond mortal men. How similar are these guys, really? But then, over the years, Superman developed an alien origin. He isn't just mild-mannered Clark Kent. He is really Kal-El, from the planet Krypton. Before the planet exploded, his father and mother, Jor-El and Lara put him in a rocket and sent him away to escape death. As his origin developed, Jor-El picked Earth as the place to send the boy. Jor-El knew that the boy would develop super powers under a yellow sun. Krypton orbited a red sun. Superman had no weaknesses, until, June 1943 and voice actor Bud Collier wanted a vacation and Kryptonite was created. Over the years, in addition to Kryptonite, Superman has a weakness for magic. In contrast, Billy Batson was an orphan newsboy; he's become a a kid radio news reporter. Clark Kent was a newspaperman until the 1970's, when his became a television news anchorman. He's gone back to being a newspaperman. Emphasis is not really put on Billy having adoptive parents - loving adoptive parents - like Jonathan and Martha Kent, Clark's adoptive parents. 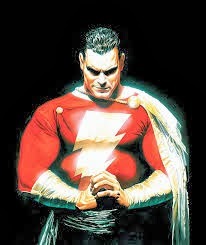 Billy's chief nemesis as Captain (Shazam!) Marvel is Doctor Thaddeus Bodog Sivana, a bald mad scientist much like Lex Luthor was from the Golden through the Bronze Age of comics. It is only a modern development that Lex has become a businessman and politician. Billy's only known weaknesses as Captain (Shazam!) Marvel is magic and lightning. Lightning is what transforms Billy into his alter ego. Here's what I wonder. When DC acquired Captain (Shazam!) Marvel why didn't they have some fun and use him differently? Instead of, say, just having Captain (Shazam!) Marvel always fighting Superman. Instead of Captain (Shazam!) Marvel always fighting Superman. Here's what else I wonder: DC Comics' Golden-Age was made up of characters like The Flash, Green Lantern, Hawkman and The Atom. Characters that have changed over the years. The Flash in the Golden-Age of comics was named Jay Garrick. From the Silver-Age forward The Flash was a police forensics officer, Barry Allen. Barry was inspired to become the Flash after lightning struck a rack of chemicals and those super-charged chemicals doused him. What if a young Clark Kent was inspired to become Superman and fight for truth, justice and the American way by watching Captain (Shazam!) Marvel? Batman's origin has been re-written that he was inspired by the Golden-Age Green Lantern, Alan Scott, a Gotham City super hero. Alan was a railroad engineer that became a Gotham broadcast owner. Bruce Wayne was mentored by a number of Golden-Age heroes. Clark never really had a mentor, other than his adopted father, Jonathan Kent. Why couldn't a modern version of Superman include an origin where Clark was inspired by Billy Batson and his alter ego? I get the "no tights, no flights" rule that Smallville operated under, but considering the opportunity for world building - like Marvel has been doing with The Avengers characters - the series was a kind of a missed opportunity. A missed opportunity that Man of Steel took hold of and ran at super speed with. DC is trying to get its characters into movies the same as Marvel, but using an opposite model. Instead of building up to a team movie - like Iron Man, The Incredible Hulk, Thor and Captain America, all leading to The Avengers - DC has been keeping characters like Batman, Green Lantern and Superman separate from each other. Until now. It appears the sequel to Man of Steel will be a group party. Couldn't Clark have been inspired by the "World's Mightiest Mortal"? 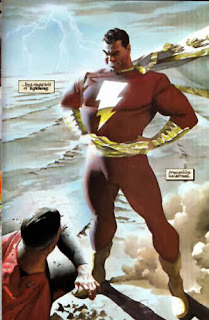 Maybe reading a Captain (Shazam!) 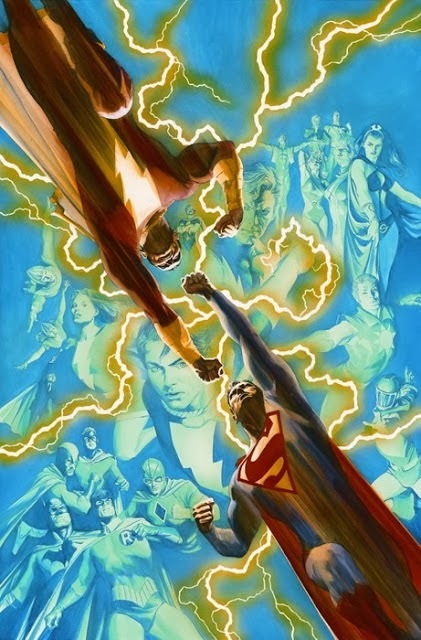 Marvel comic book - Smallville's Lex was a Warrior Angel fan and had every issue. A Warrior Angel movie was even filmed in Smallville. 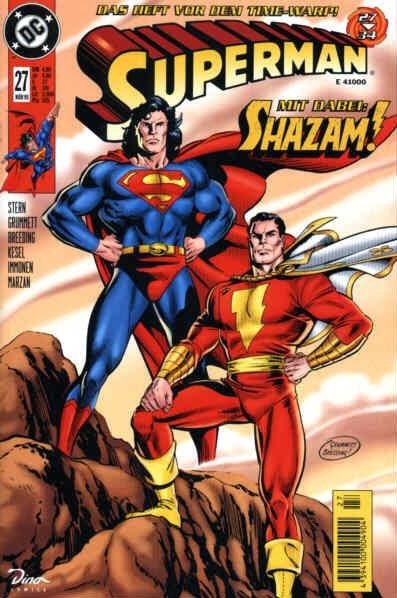 Maybe Lex's father, Lionel, could have owned a production studio in Metropolis for a Shazam! television series.